But obviously this person does not have stong skills in hitting the spellcheck button or reading over their resume. This resume went straight into the round file where it came to rest beside the one from the person with “office cleric” experience. My two daughters, two of their friends, and I went to Pasadena yesterday and did a very Southern California kind of thing - we helped decorate a Rose Parade float! My Youngest Daughter is a student at Cal Poly Pomona and the two Cal Poly schools (the other one is in San Luis Obispo) have a student designed and built float in the Rose Parade every year. So Youngest Daughter got us in to volunteer this year for the first time. Yesterday I learned all about the glamorous (not) life of Rose float decorating! 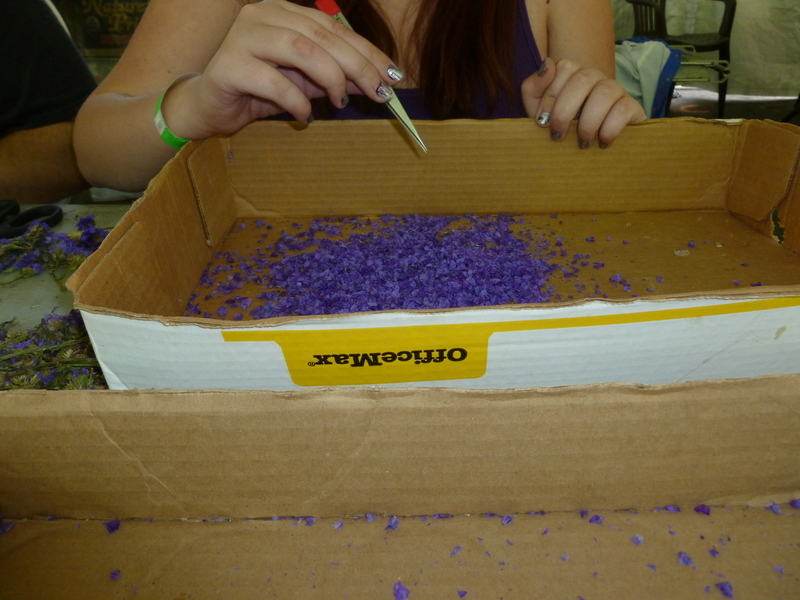 This is me cutting statice flowers into tiny little bits. I spent something over three hours carefully cutting little purple flowers off of dried statice. That was interspersed with picking through the flowers bits I cut off to snag any green stuff out with tweezers. Yep, over three hours! But, we discovered that while cutting little dried flowers and picking out tiny bits of leaf with tweezers sounds like the grunt job, it was actually the really GOOD job! For a few minutes I tried to escape it and my job then became hauling big tubs of eucalyptus branches around. My Youngest Daughter and her two friends got to glue very thin sheets of seaweed to the float, something that started becoming annoying due to the smell of the seaweed. My Eldest Daughter got to get into an awkward position and stick white rice to glue she spread on a wall of a building on the float. She had to lean over a gap in order to do this. My Eldest Daughter is using tweezers to pick any and all offending bits out of the cut flowers. However, in spite of its less than glamorous nature, all five of us agreed that we had a good time and really enjoyed seeing the “behind the scenes” aspect of Rose float decorating. I think it was especially enjoyable because the Cal Poly rose float is a student endeavor. I found out some interesting facts related to Rose float building as I cut the little flowers. Cal Poly grows their own statice and dries it in a lab room on campus. They cut those dried flowers in to little bits (like I was doing) all year-long in order to have enough. 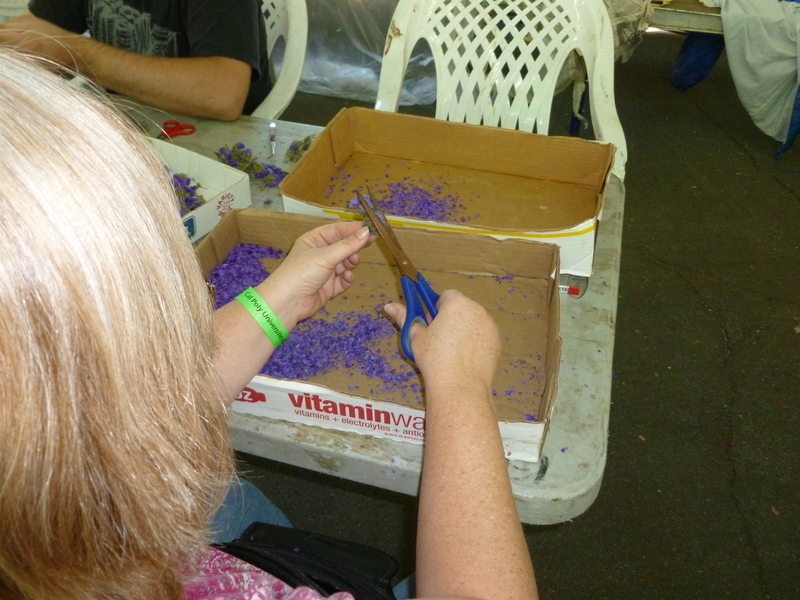 Some of the flowers are put through a blender to create purple or blue dust. In other places on the float it is used just as we made it, little tiny bits of flowers. The Cal Poly float has a super hero theme this year. The woman super hero has lovely red lips which I discovered are covered with freeze-dried strawberry dust. I walked by just as they were applying it and it smelled yummy! 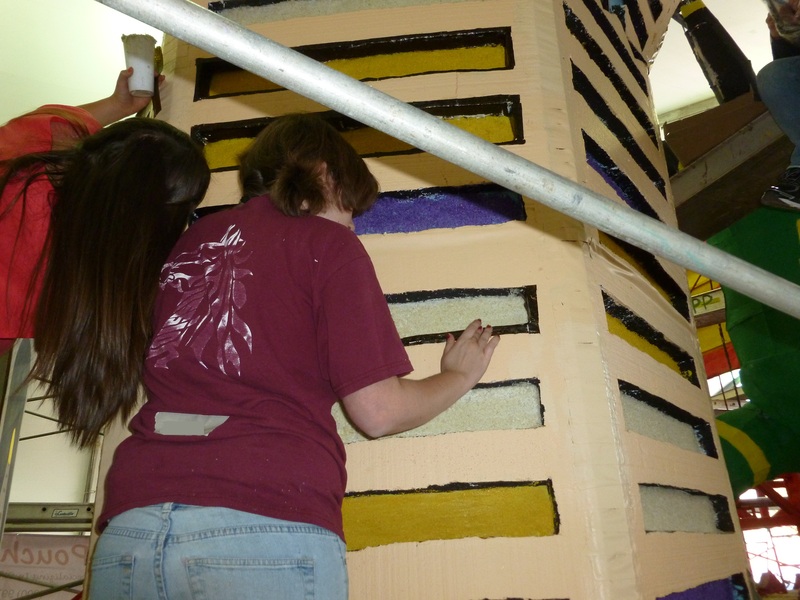 Here is a shot of my Youngest Daughter gluing seaweed to the window edges of a high rise building on the float. Every visible surface of a Rose float has to be covered in natural material and we saw all kinds of different things they were using on the float: ground coffee beans, brown coffee fibers (used for hair), ground dried pink bougainvilla flowers, white statice, parsley, the white rice I mentioned before, and I even saw a bag of kitty litter that is made of wheat chaff. They weren’t starting to decorate with the fresh material yet as all of those flowers have to be cut and put in those little florist vials of water before being placed on the float. They were just about to start that process as we left, filled with the goodness of having helped the Cal Poly schools with their Rose Float. We all agreed that we want to do it again next year! December 25th was a beautiful day in Southern California. The weather was perfect after several days of wind. My brother, the golfer, went on a little “Easter egg hunt” and found eight or so golf balls in our back yard, including the one the whistled in over his head as he was looking. This was after Hubby found about the same amount the day before, and didn’t count the three that were in the bottom of the pool. The holidays really seem to bring out the bad golfers! This being the day after Christmas, I am contemplating what I will and will not do differently next Christmas. The things that will stay the same include the meal, which was yummy if I do say so myself, and the schedule, which has always worked in the past and worked again this year. My husband and I managed to use up the roll of wrapping paper that has annoyed me ever since I bought it. It was sort of plastic coated and required lots of tape to keep the paper from popping open and exposing the present. With concerted effort, lots of presents were wrapped in “Ho Ho Ho” paper and that annoying wrap is history! 1. Never buy the aforementioned type of wrapping paper again. 2. Buy some larger boxes so I don’t have to wrap so many different things. Young adult girls like to get clothes and, really, each piece of clothing does not have to be wrapped separately! 3. Make sure that the dog has plenty of time for her morning constitutional. When I let her out Christmas morning I didn’t give her enough time, apparently. An hour and a half later she, um, made a deposit just a few feet from where we were opening presents. Yep, she is going to get a nice long morning visit to the back yard next year! 4. I am going to take more photos. Can’t have too many photos of Christmas! Really, of that was all that needed tweaking, it must have been a pretty good Christmas, and it was! Hope yours went well, too. The latest set of resumes are kind of lack-luster, but there has been the occasional bright spot. If we were looking for a little divine help, one guy claimed to have a previous job of office cleric. Needless to say, this person will not be getting an interview! This is the day where I ward off panic all day long thinking “Did I remember to buy a ham?” or “Is everything wrapped?” but that is OK. It just isn’t Christmas without a little of that panic hanging out just below the surface. It keeps the holiday adrenaline rush going! I have put my two daughters on notice that today we are going to the mall to eat lunch and enjoy the hustle and bustle, without having to join in that hustle and bustle ourselves, unless we want to, because it is a really good sale! I remember when I was a kid and the week before Christmas crawled by at a pace so slow I was sure that time was standing still. Now it rushes by at a spend so fast I thought it was against the laws of nature! Christmas Eve Eve already. Whew! I wish everyone a lovely weekend. Christmas comes but once a year….. I know it is Christmas…. I know it is Christmas time because…. I still have a boat load of cookies in my kitchen from the cookie exchange we went to. I normally try to keep those evil little suckers out of my house but it is Christmas, when the lion is supposed to lay down with the lamb and we are supposed to make amends with our enemies. Take my word for it, I am REALLY trying to befriend this batch. A real tree has taken up residence in my living room. It is slowing turning into a dry fire hazard and hey, nothing says “Happy Holidays” like having a fire hazard in my living room! The wind started up again early this morning and it is really blowing. In inland Southern California, it isn’t December unless you have to chase your outside Christmas decorations down the street a half-dozen times before December 25th. As sure as I know that the sun will come out tomorrow, I also know that a Christmas card will arrive in my mail box tomorrow or Saturday from someone I didn’t send one to, and I will not have enough time to get one to them by December 25th. It is great to have traditions this time of year and this is one of mine. My Eldest Daughter received a package from a foreign land today. It was something she had ordered off of Ebay. It had been opened and resealed and had a green sticker on it from Homeland Security, indicating that they had inspected it. We had to laugh. How disappointed the inspectors must have been to discover that the box only contained Japanese Pokemon cards! My Eldest has become the Crafting Queen of our house. She uses the Pokemon cards to make wallets. She has discovered that people her age feel a deep nostalgia for the Pokemon cards of their youth. THAT makes me laugh! Weren’t Pokemon cards just, like, yesterday? Oh, our perspective is so different depending on our age, isn’t it? I belong to a local Historical Society. We have discovered that people have a hard time wrapping their minds around the idea that a building built in their life time can be historic. However, according to the Secretary of Interior standards, we should be looking at any building over 50 years of age for possible historic eligibility. Sigh! That means if I was a building I could be declared historic! Even pets can give me guilt! My post last Friday was about my cat and dog’s conspiracy on Thursday to prevent me from sleeping in. Well, I still think the cat was engaged in a conspiracy but now I know the dog was conked out because she was getting sick! Poor thing! I feel so guilty of accusing her of having it out for me! In spite of the fact that she is up to date on all the vaccinations available to give a member of the canine species, and even though she rarely encounters another dog, she has managed to come down with kennel cough! The name of that virus is a misnomer. It should be called “kennel hacking, barking, gagging cough that keeps my owners up all night.” I feel like I have a baby again. Remember when the baby got sick and there wasn’t much you could do to relieve the symptoms? Works the same way with a dog. Hubby and I spend our days and nights dispensing medicine, providing warm broth, giving her snacks, chew toys, and peanut butter, anything to calm the cough. Meanwhile, we have our finger on the mute button so we can pause the TV when she starts coughing as it is impossible to hear much of anything when she gets going. I have NEVER had a dog with this before. Aren’t the humans supposed to get sick at Christmas time? I am happy to report that she is getting better. However, I was told by the vet that if she is still coughing after we use up the seven days of cough medicine, I am to call them to get more. I felt that this was ominous news….Ominous news for me getting enough sleep, I mean. For those who live near me I must mention that this virus is going around the area and is air bourne. I wish you luck! Last week she had a contest to give away the extra Perry the Platypus Pez dispenser she had purchased. She and her husband each purchased one for their little daughter’s stocking and they didn’t need two! Imagine my surprise when I won it!!!! Yes, Perry will be winging, or trucking, his way to me from Minnesota! I have a number of blogs I enjoy following and one of these days, I am hoping very soon, someone with more computer knowledge than me (Don and Joe, are you listening?) will help me actually put those blogs under the “Blogs I Love” heading in the sidebar on this page. Until then, feel free to check out Never Done It That Way Before. And be jealous of me enjoying Pez from my Perry the Platypus!